In the article a rare clinical observation of a patient with diffuse idiopathic skeletal hyperostosis with damage to the cervical spine and pronounced dysphagia and dyspnea is presented. The described case vividly demonstrates difficulties in diagnosis and treatment tactics of this disease and raises the question of necessity of diagnostic alertness to the diffuse idiopathic skeletal hyperostosis in patients with progressive dysphagia and dyspnea, not only in those of aged and old age, but also in younger patients (the age of described patient was 56 years, while in 95% of cases described in the international literature, patients were above 60). spine, hyperostosis, Forestier's disease, diffuse idiopathic skeletal hyperostosis, dysphagia, dyspnea. Diffuse idiopathic skeletal hyperostosis (DISH) (the term proposed by D. Resnick) is also known as Forestier's disease. It was first described by J. Forestier and J. Rots-Querol in 1950, who proposed to term «ankylosing senile hyperostosis of the spine» . It is characterized by ossification of the anterior longitudinal ligament, with predominant lesion of the thoracic and cervical sections of the spine . The etiology of Forestier's disease is not completely understood. The leading role in the etiopathogenesis of the disease is assigned to age-related involution of connective tissue . Some authors believe Forestier's disease to be provoked by neuroendocrine disorders (diabetes mellitus, obesity) [3,4]. The disease takes a sluggish course and usually manifests in senile age with variants of the clinical presentation depending on spread of the process and the extent of over growth of bone ossificates. Most DISH cases are asymptomatic. The most common clinical manifestations are pain syndrome and dysphagia [5-7]. The only available in literature meta-analysis of DISH (Dutta S. et al., 2014) includes only 73 cases of the disease and covers the period from 1973 to 2010 inclusive. In 94.52% of cases, patients were more than 60 years old . The article presents our clinical observation – a DISH case with rare manifestations (dysphagia and dyspnea) in a patient of a relatively young for this disease age – 56years. Patient F., 56 years of age was admitted to the Neurosurgical Department of Kolomna Central Regional Clinical Hospital on 07 Sept 2017. From the anamnesis, the patient was observed in the local outpatient clinic at the place of residence since 2007 when he developed exacerbation of chronic laryngitis. 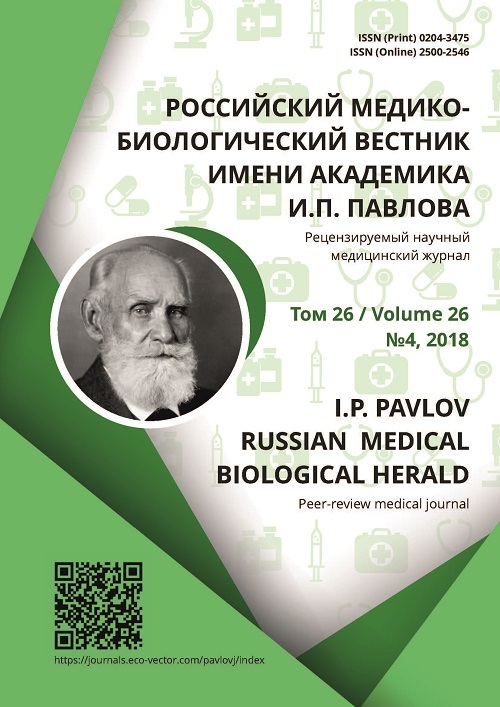 In 2011 he was taking treatment at the Neurology Department of Kolomna Central Regional Clinical Hospital with the diagnosis: Ischemic infarction in the vertebrobasilar system with oculomotor disorders. From 2011 to 2013 the patient was under observation of a neurologist for the given diagnosis. Since 2013, he began to notice periodic difficulties in swallowing for which reason X-ray examination of the stomach was conducted with barium (24 Oct 2013). X-ray examination result. The proximal part of the esophagus looks deformed, with a large irregularly shaped filling defect in the left half. Conclusion: Space occupying lesion of the proximal parts of the left half of the esophagus. In April 2017 the patient underwent treatment in the Neurosurgical Department for closed fractures of the arch of C5 vertebra, of the body of C2 vertebra, contusion of the cervical section of the spine (the trauma was received in a road accident). After a course of conservative treatment (analgesics, immobilization of the cervical vertebrae), the patient was discharged with regression of the pain syndrome for outpatient treatment. In June 2017 computed tomography of the cervical section of the spine was performed. Conclusion: Space-occupying lesion of the larynx. Due to progressive breathing difficulties, tracheostomy was carried out at the Department of Otorhinolaryngology. Biopsy of the lesion was recommended. On 07 Sept 2017, the patient by himself applied to the Neurosurgical Department with complaints of pain in the cervical section of the spine and progressive difficulty in swallowing. He was hospitalized. On admission, the general condition was satisfactory; moderate nutrition; skin and mucous membranes of normal color, clean; breathing through the tracheostoma. No comorbid somatic conditions were found. Neurological status: cranial nerves without peculiarities. Strength in hands reduced to 4 points. Tendon reflexes of the arms sharply exaggerated, more on the right, reflexes of lower extremities are normal, symmetrical. Bilateral hypoesthesia in the zone innervated by C4, C5, C6 nerve roots. X-ray (Fig. 1) and computed tomogram of the cervical spine showed no significant signs of spinal canal stenosis; fracture of the body of C2 vertebra in the consolidation stage. No obvious signs of space occupying lesions on the neck level. Coarse osteophytes along the anterior surface of the bodies of C3-C6 vertebrae, comparable in size with vertebral bodies, signs of coarse compression of the larynx and esophagus. Clinical diagnosis: Osteochondrosis, spondylosis deformans of the cervical section of the spine with stenosis of the larynx, esophagus. Elimination of spondylosis, of osteophytes of the cervical spine (09 Dec 2017) was conducted: in access from the anterior surface, osteophytes of C3-C6 vertebrae were exposed that were removed using spinal chisels and crown drills. In the postoperative period, positive dynamics was observed with normalization of respiration and swallowing (no dysphagia, dyspnea were noted). The tracheostoma was removed after 7 days (Fig. 2). The patient was discharged in satisfactory condition. Thus, the given clinical observation clearly demonstrates the complexity of diagnosis and treatment in a patient with diffuse idiopathic skeletal hyperostosis (Forestier’s disease) with lesion of the cervical spine and evident dysphagia and dyspnea. This case raises the question about diagnostic alertness to the given disease in patients with progressive dysphagia and dyspnea, and not only in those of old, but also of younger age (the age of our patient was 56 years, while 95% of cases of the disease described in the international literature, concern patients older than 60 years). Forestier J, Rotes-Querol J. Senile Ankylosing Hyperostosis of the Spine. Annals of the Rheumatic Diseases. 1950;9:321-30. doi: 10.1136/ard.9.4.321. Resnick D, Niwayama G. Radiographic and pathologic features of spinal involvement in diffuse idiopathic skeletal hyperostosis (DISH). Radiology. 1976;119(3):559-68. doi: 10.1148/119.3.559. Verlaan JJ, Boswijk PF, de Ru JA, et al. Diffuse idiopathic skeletal hyperostosis of the cervical spine: an underestimated cause of dysphagia and airway obstruction. The Spine Journal. 2011;11: 1058-67. doi: 10.1016/j.spinee.2011.09.014. Castellano DM, Sinacori JT, Karakla DW. Stridor and Dysphagia in Diffuse Idiopathic Skeletal Hyperostosis (DISH). Laryngoscope. 2006;116(2): 341-4. doi: 10.1097/01.mlg.0000197936.48414.fa. Dutta S, Biswas KD, Mukherjee A, et al. Dysphagia Due to Forestier Disease: Three Cases and Systematic Literature Review. Indian Journal of Otolaryngology and Head & Neck Surgery. 2014; 66(Suppl 1):379-84. doi: 10.1136/ard.9.4.321. Copyright (c) 2018 Loginov N.V.